For this layout, I knew which photo I wanted and needed a background color to anchor my "302" 6x6 papers from Farmhouse Paper Company. 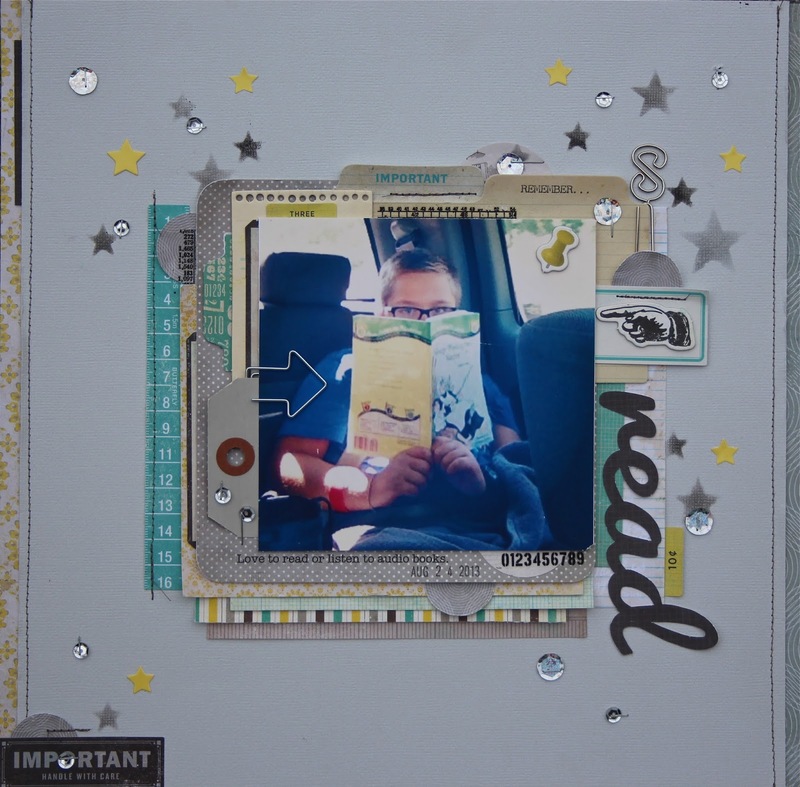 I layered my papers, metals, tags, stickers, chipboards until I developed a collage that I liked. 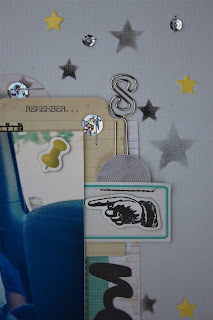 Once my papers were glued down, I decided to add scattered stars using the Stars layering Stencil by Tim Holtz. This stencil allowed my to place different size stars exactly where I wanted them. I threw on some yellow punched stars I had on hand and some sequins. I stapled the sequins on to help bring in more metal for balance. They were attached with Tim's Tiny Attacher and a long reach stapler from Staples. I added stitching, foam tape behind items that needed dimension and a title cut from my Silhouette. Thank you for taking a peek at my layout. Hope you are inspired to fill some more pages of your albums! Here are the items from the shop here at Eclectic Paperie! So pretty! I love the stars and sequins! Beautiful layout Mary Ann, adore all the stars and sequins as well with the pop of yellow!! Ahhhh I remember those years well with reluctant boys..great idea the audio books. This is great, Mary-Ann! I love the stitching and all the great little sparkly and super cute details! Love your pages and this one is no exception. The stitching and they way you layered all the bits and pieces. Love it.